Photo Courtesy of chron.com || Much work remains to be done after recent hurricanes destroyed parts of Florida, Texas, Puerto Rico and the U.S. Virgin Islands. 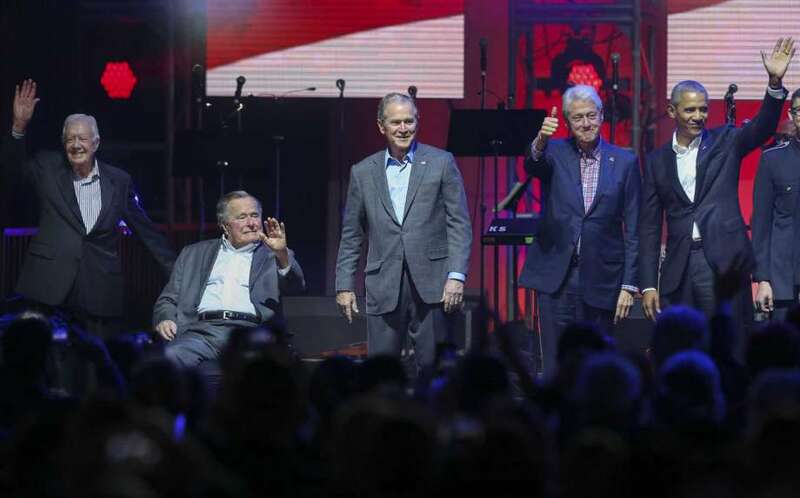 On Saturday, Oct. 21, all five living former Presidents gathered together at the Reed Arena at Texas A&M University in College Station, Texas to attend a benefit concert featuring performers such as rock and country musicians Lyle Lovett, Robert Earl Keen, Sam Moore and Yolanda Adams. Further, country music singer Lee Greenwood served as emcee for the event. According to CNN Politics, money raised through ticket sales will be distributed through many various organizations offering relief to victims of hurricanes throughout Florida, Texas, Puerto Rico and the US Virgin Islands. Lady Gaga also made an appearance at the concert, tweeting a picture of herself standing behind the group of five former presidents. CNN Politics reported that Lady Gaga also made a significant contribution to hurricane relief efforts of her own. Despite the work done and money raised to aid hurricane victims throughout various parts of the country, a substantial amount of rebuilding still needs to be done. In Puerto Rico, NBC News reports that water contamination is putting many individuals and families at great risk, and the potential spread of leptospirosis looms as a threat to devastate the territory as a whole. The current administration has been criticized for its lack of response to victims of Hurricane Maria, and the situation is only getting worse. Also, NBC reports that authorities are claiming a quarter of the island’s population still lacks access to running water as of last Wednesday, but the areas that do have water are not evenly distributed. The New York Times reports that Kevin Jose Sanchez Gonzalez, 25, called the situation “like going back in time.” Much of the island is dark, hot and isolated from everything and everyone else. “Of course, what happened in Houston pales in comparison to the devastation in Puerto Rico,” Albright added. Smith students wanting to contribute to hurricane relief efforts can donate to a multitude of charities such as Oxfam, GlobalGiving and ConPRmetidos.